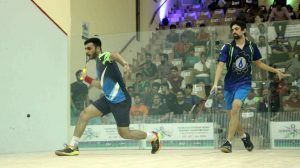 Lahore: All the seeded players qualified for semi-finals of the SNGPL Pakistan International Squash Circuit-II Men’s and Women’s 2018 after defeating their respective opponents in the quarterfinals played at the Punjab Squash Complex courts on Thursday. In the first quarter-final of the day, top seed of the tournament Farhan Zaman outsmarted Kashif Asif by 11/6, 11/5, 11/9. Wildcard entrant Kashif, who earlier upset seeded player Israr Ahmed, had no answers to powerful shots and technical game of Farhan Zaman and lost his encounter 3-0 in just 19 minutes. 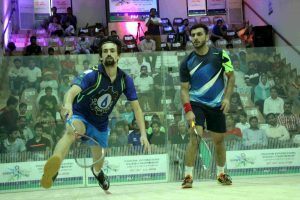 Pakistan squash hope Farhan Mehboob once again showed his class against spirited Asim Khan by defeating him 7/11, 11/9, 13/11, 8/11, 11/6 after a tough battle of 79 minutes. Both the players weren’t ready to give up and they continued their struggle till the end but it was Farhan Mehboob, who kept his nerve and finally won the marathon match by 3-2. Another match of the day was contested between two 4th seed Tayyab Aslam and 7th seed Amaad Fareed and ultimate the winners was Tayyab Aslam, who won the epic encounter by 3-2 in 67 minutes. Tayyab though could not start well as he lost the first game by 9/11, yet he made a strong comeback and won the next two games in a row by 11/3 and 12/10. Amaad then changed his game plan, which paid dividend and he succeeded in the winning the fourth game 11/9. In the fifth and decisive game, Tayyab faced tough resistance from his opponent before winning it 11/9, thus he recorded a hard-fought and well-deserving victory against Amaad. Promising talent Ahsan Ayaz beat Syed Azlan Amjad by 7/11, 11/3, 11/4, 11/5 in 28 minutes. On Friday, Farhan Zaman will take on Farhan Mehboob in the first semi-final at 4:00 pm while Tayyab Aslam will vie against Ahsan Ayaz in the second semi-final at 4:45pm. Saima Shaukat thrashed Noorena Shams 11/0, 11/2, 11/3 in 11 minutes. Madina Zafar routed Zahab Kamal Khan 11/4, 11/3, 11/6 in 14 minutes. Riffat Khan beat Zoya Khalid 9/11, 11/3, 9/11, 11/4, 11/5 in 42 minutes. On Friday, Saima Shaukat will face Madina Zafar challenge in the first semifinal at 2:30 pm while Faiza Zafar will vie against Riffat Khan in the second semifinal at 3:15 pm.